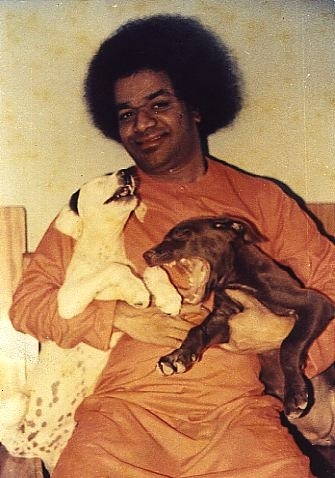 Swami holding Jack and Jill - the two dogs he had during the early years. This story comes from our store of memories from way back in the early 1990’s. I never met Derek although his story was passed around from devotee to devotee at the time. When Derek was only 8 years old, he lost his mother. The children in the school were inconsiderate and often made tactless remarks. Every night after his return from school, he cried for his mother. He often had dreams of her, where she comforted him. In a few dreams, she tried to guide him in the principles of honourable living. However, when he became a teenager, he met a young woman who had left home and was on drugs. He took pity on her and offered her shelter in his home. Three years later they were married and later two baby boys came along and, at last, Derek had a family again. His wife stopped craving drugs and for nine years they lived a very happy and contented life. Some years later his wife left him. According to Dutch law, the boys had to go with her. Derek felt shattered and life didn’t seem to have any meaning for him. He tried to drown his sorrows in excessive drink. It was not long before he was admitted to hospital with advanced liver failure. The dream was so real that as soon as it ended he awoke and found himself shouting, “Where is he? Where has he gone and where has the lotus flower gone?” As he kept shouting, the medical attendants became alarmed. They gave him an injection to allow him to sleep more peacefully. Before he could drift into sleep, a doctor came to say that he would speak to him later, when he was off duty. When Derek woke up the doctor was there. After listening to Derek’s dream, he pulled a book out of his pocket with Baba’s picture on it and asked him if this was the image he had seen in the dream. Derek excitedly exclaimed that it was. Derek was very disappointed when the doctor told him that this person named Sai Baba lived in India, as Derek had no means to travel there. The doctor told him not to worry as he would pay for the fare. This unexpected gift helped Derek to regain most of his strength and happiness. Arriving in Puttaparthi and not knowing any language except Dutch, Derek did not know what to expect from the ashram. At the very first Darshan, Derek’s row had token number one, Derek swiftly found an excellent place in the darshan area. When Baba came out for Darshan, Derek saw him clearly, but something strange happened, and he felt like closing his eyes. While his eyes were shut, a vision appeared in his mind. In this vision, he saw a funeral taking place. He was quite shocked to see that he was witnessing his father’s funeral, whom he had left only a few days ago. Also, a number kept appearing before his closed eyes. When he opened his eyes, Baba was standing in front of him and smiling. Derek spoke to a Dutch lady, then described his vision to her. He didn’t know what the number in the vision meant. The lady told him that it appeared to be a telephone number in Holland. They tried this number and and indeed there was a dialling tone. A lady answered, and to Derek’s surprise, it was his sister-in-law. She seemed surprised to hear Derek’s voice, because the number had always been ex-directory and Derek had never known the number. Besides, Derek had lost contact with his brother long ago. His sister-in-law informed him that his father had passed away three days before, and the funeral had been yesterday. Derek couldn’t believe it. This experience, apparently from Sai Baba, moved him deeply.But Derek’s condition still continued to deteriorate. He could hardly eat anything. One day he developed three abscesses on his foot, which started to discharge, and left three large holes in his foot. These holes later healed and Derek felt relieved. Derek believes that all the poison in his body had been dissolved and his health would now improve. Today, he is fully fit and full of enthusiasm for life. Baba told him to stay at Puttaparthi for sometime, and offer service to Dutch visitors. He now speaks English and is trying to learn Sanskrit and Telegu. What can we say about such a story? It seems Sai Baba offers hope and inspiration to many seekers. ← The Winds Of Change, 2002/3 Sathya Sai Memories Cont.